Hits 7 makes for an ideal complement to Now That’s What I Call Music 10. However it loses points because of the number of early fades.There are 14 in total and were presumably created due to limitations of the vinyl’s running time. It’s unfortunate that these masters were used for the CD version. Abigail Mead and Nigel Goulding – Full Metal Jacket (I Wanna Be Your Drill Instructor). WEA Star Galerie. Fleetwood Mac – Little Lies. WEA Star Galerie. Alexander O’Neal – Criticize. Up Beat 2. Prince – U Got The Look. WEA Star Galerie. Donna Summer – Dinner With Gershwin. WEA Star Galerie. Chic – Jack Le Freak. 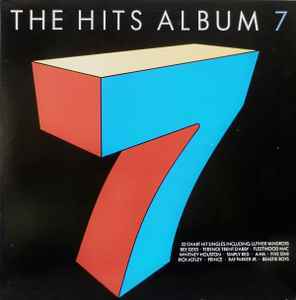 Hits Album 7 (Dutch). Sisters Of Mercy – This Corrosion. WEA Star Galerie. Desireless – Voyage Voyage. Pop Highlights. Bill Medley and Jennifer Warnes – (I’ve Had) The Time Of My Life. Now That’s What I Call Music 19. Atlantic Starr – Always. Love Ballads 1. Ray Parker Jnr. – I Don’t Think That Man Should Sleep Alone. Hits Album 7 (Dutch). LL Cool J – I Need Love. Now 10th Anniversary 1987. Kenny G – Songbird. Now This Is Music 7: Volume 2. Simply Red – Ev’ry Time We Say Goodbye. Blitz 2.